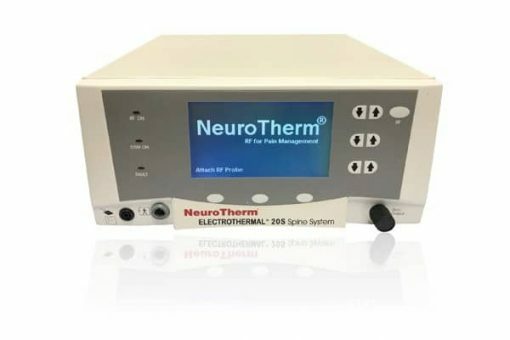 The Neurotherm 20S is perfect for startups pain management offices, single MSK physician offices or anyone else who just wants a great deal on a Radiofrequency Ablation Machine (RFA) for pain management procedures. Flexibility and convenience, with a flexible, open architecture and a built-in software card, the Neurotherm 20S is easily upgradable to keep pace with your needs. It’s easy to integrate into your practice thanks to its portable, lightweight design and simple, intuitive operation. The Neurotherm 20S single channel radiofrequency generator was designed for unmatched ease of use. It features user-friendly controls, with a built-in LCD screen with real-time treatment data and easy-to-understand text messaging to indicate system information. The system settings are configured for use in most situations eliminating the need for adjustment for every purpose. With active Autoprobe recognition, the 20S takes the guesswork out of changing RF electrodes. When you insert an RF probe into the generator, it automatically adjusts itself to the right settings, saving time and potential for errors. It just couldn’t be easier. Save money and make your minimally invasive spinal procedures easier with the simple to use, intuitive Neurotherm 20S RF Generator. The Neurotherm 20S RF System is compatible with a wide range of probes and needles. Giving you the widest range of applications, RF probes and catheters, the NeuroTherm 20S RF Generator is the one spinal RF system that does it all. No other single RF machine combines this much flexibility and ease of use into one inexpensive radiofrequency generator for pain procedures. 8-Pin Universal Extension Cable, Power Cord and Foot Pedal. Note: RF Denervation Probes are reusable and supplied in a sterilization tray. The Neurotherm 20S RF Generator is the most basic radiofrequency generator designed for pain management. The 20S Generator almost always shows errors when you first boot up. Its saving grace is its price. The Neurotherm 20S is the least expensive lesion generator on the market.